The Harley-Davidson® Fat Boy® Lo is part of the Harley-Davidson® Softail® lineup. 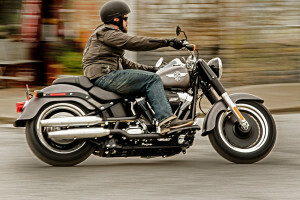 The Fat Boy® Lo offers the same fat custom style that you get with the Fat Boy® while putting you lower to the ground. 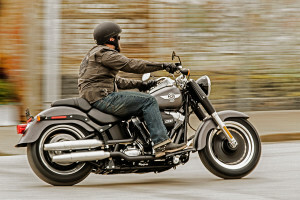 This offers an easier entry for riders young and old, as well as a lower center of gravity for unbeatable handling. Find out more about the Fat Boy® Lo right here at Riverside Harley-Davidson®, your Los Angeles and Inland Empire area dealer. The 2017 Fat Boy® Lo is designed to invoke classic choppers from the 60s and 70s with fat custom detailing and plenty of premium features. 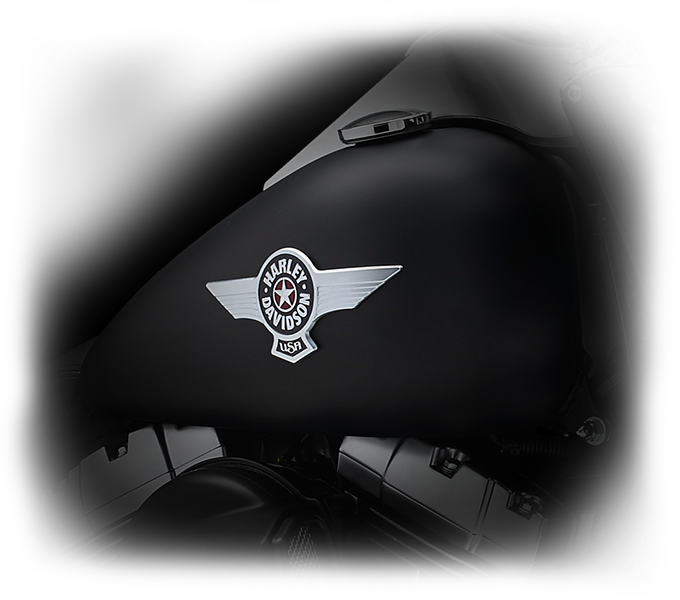 Custom Tank Details: Get a load of that chrome side badge, satin chrome speedo, and ignition switch console, and you’ll feel transported back to the glory days of chopper style. 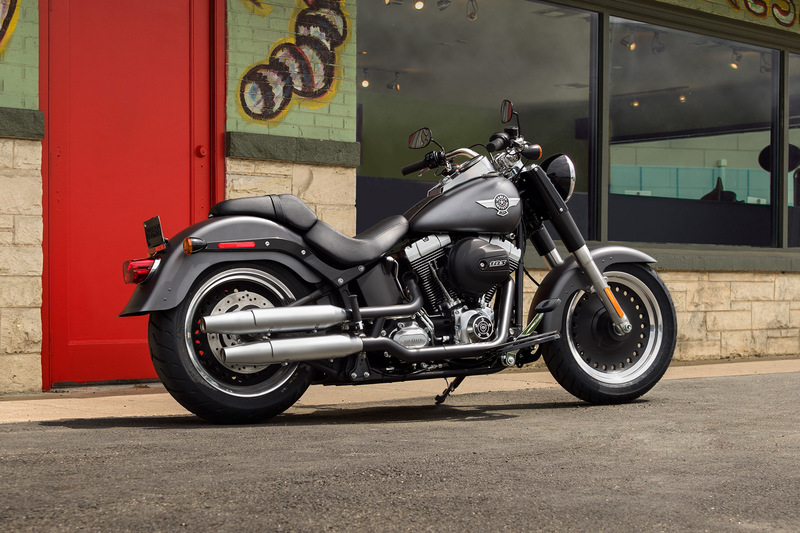 Hidden Rear Shocks: Like any Softail® model, the Fat Boy® Lo comes standard with a slammed rigid bike look. That doesn’t mean it isn’t comfy – the hidden rear shocks absorb any bumps on the road. Fat Features: From the oversized front fork to the huge 200mm tire in back, every part of this bike is big and bold for that unique fat custom look. 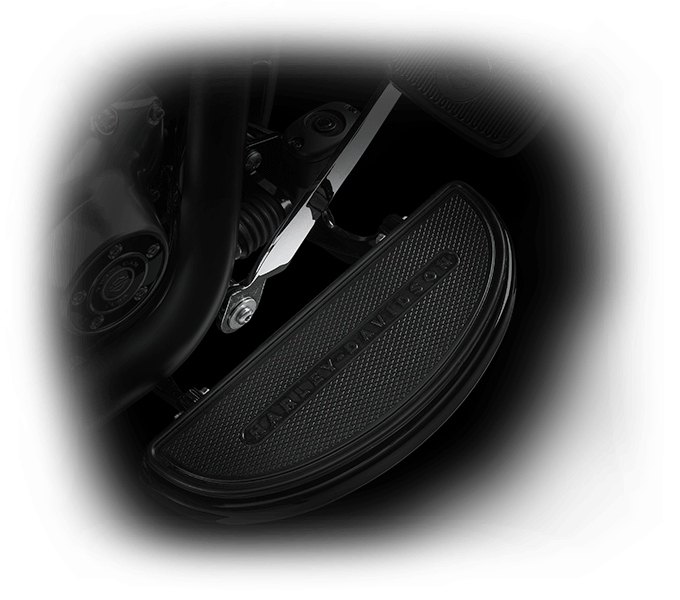 Blacked Out Finishes: The Fat Boy® Lo features custom black finishes on the frame, swing arm, front shock covers, derby cover, horn cover, coil cover, oil filter cover, and more. 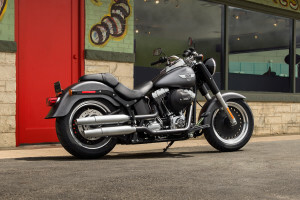 The Fat Boy® Lo is powered by the big, burly High Output Twin Cam 103B™ V-Twin that delivers confident acceleration and mile after mile of air-cooled reliability. 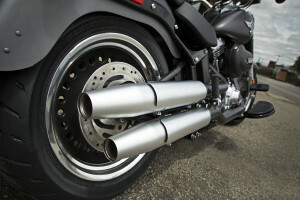 New High Output Twin Cam 103BTM Engine Power: The latest Twin Cam delivers mountains of torque and plenty of horsepower, so you can get those fat tires up to speed in a hurry. 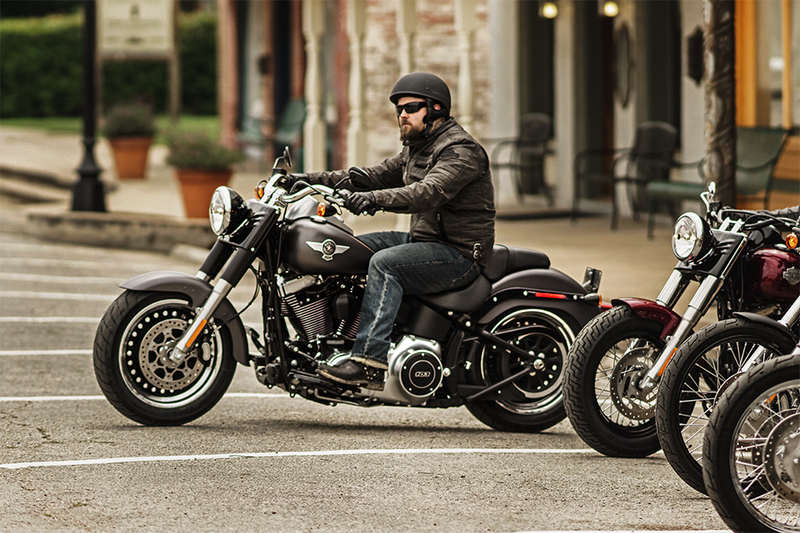 Pure Harley-Davidson Styling: The Fat Boy Lo® looks as good as it runs. 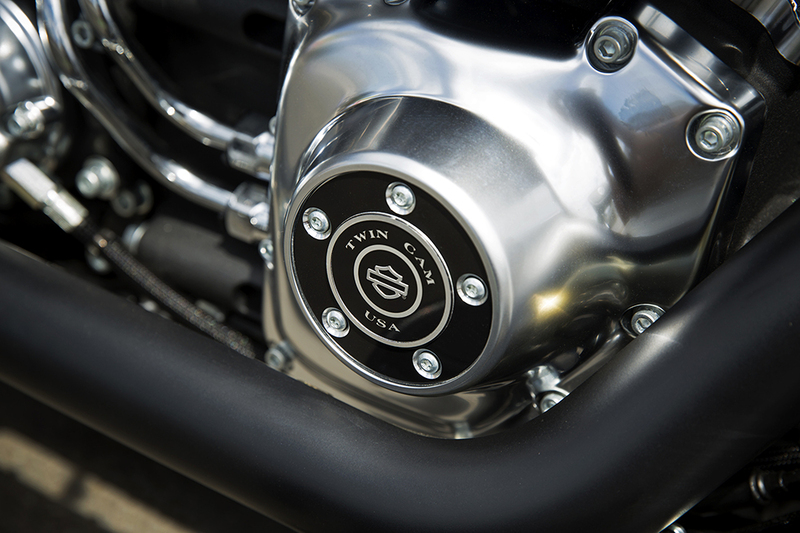 This beautifully crafted engine gets premium features like black powder coated heads, machined cooling fin tips, satin chrome rocker covers, and more. Six-Speed Cruise Drive® Transmission: Riding the Fat Boy® Lo is a blast. The smooth shifting gear box lets you slip through the gears, and a tall top end allows for low rpm cruising at highway speeds to cut down on noise and vibration. New Air Cooled, High Output Twin Cam 103BTM Heritage: A century of experience went into this latest engine, so you know it’s got the staying power you want. 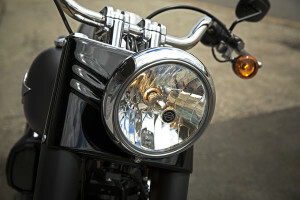 It comes from the venerable line of V-Twins that includes the Panhead, Shovelhead, and Flathead, among other famous names. New High Output Twin Cam 103BTM Engine Innovation: This latest entry into the lineup includes lightweight alloy components to manage heat and electronic sequential fuel injection to boost combustion efficiency and power. The Fat Boy® Lo is bike that’s designed to handle just as well as it looks. Low Suspension: The Fat Boy® Lo is 1.15 inches lower than the standard Fat Boy® for a seat height of only 24.25 inches. That puts you in a low, commanding position which perfectly suits smaller riders as well. Fat Dunlop® Tires: These oversized tires deliver the traction you need and enough dampening to smooth out small vibrations in the road. 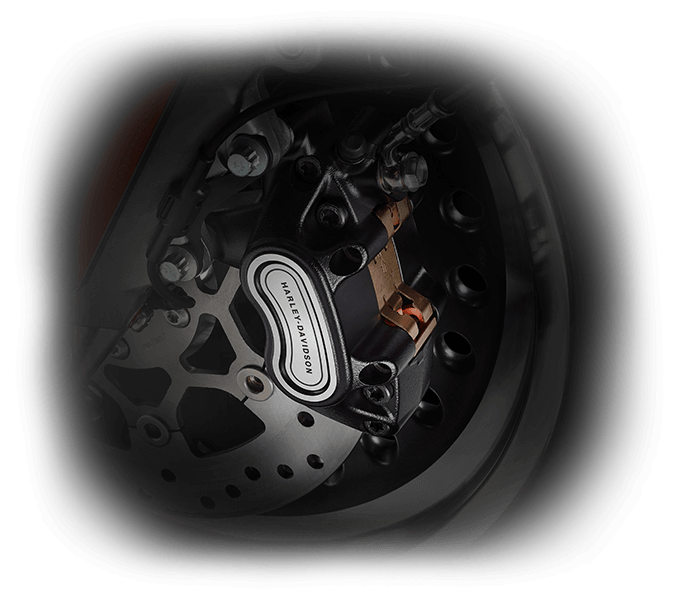 Front Brake System: The new brake system on the Fat Boy® Lo requires 40 percent less lever force thanks to new, more powerful calipers and larger brake rotors. 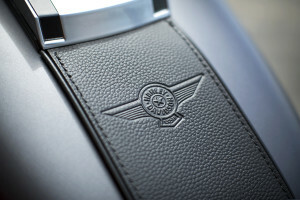 New Ergonomically Designed Hand Controls: Your hands are right where you want them with these ergonomically hand controls. You’ve got everything there right on the bars. New Electronic Throttle Control: Since the Fat Boy® Lo features electronic throttle control, it’s easy to run the wires inside the bars for a clean look, and it’s simple to add cruise control later if you want to upgrade. 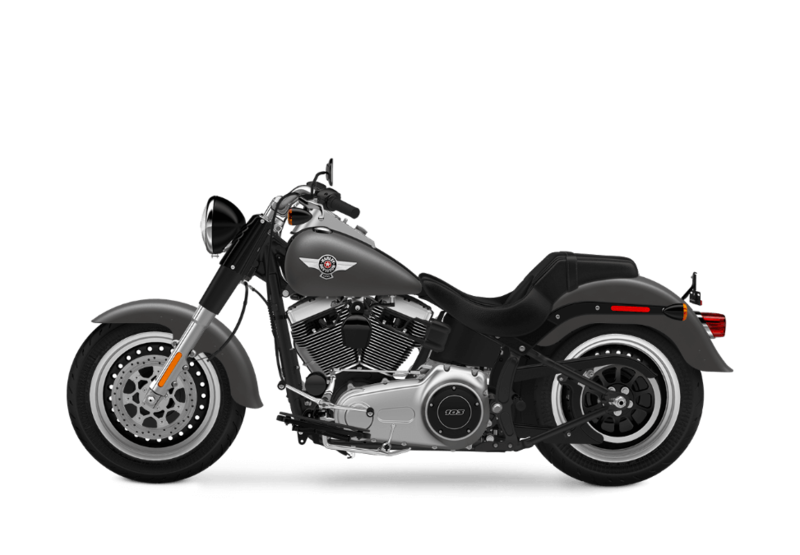 The Fat Boy® Lo might utilize iconic fat custom style that comes from the 60s and 70s, but it still gets modern features you want. 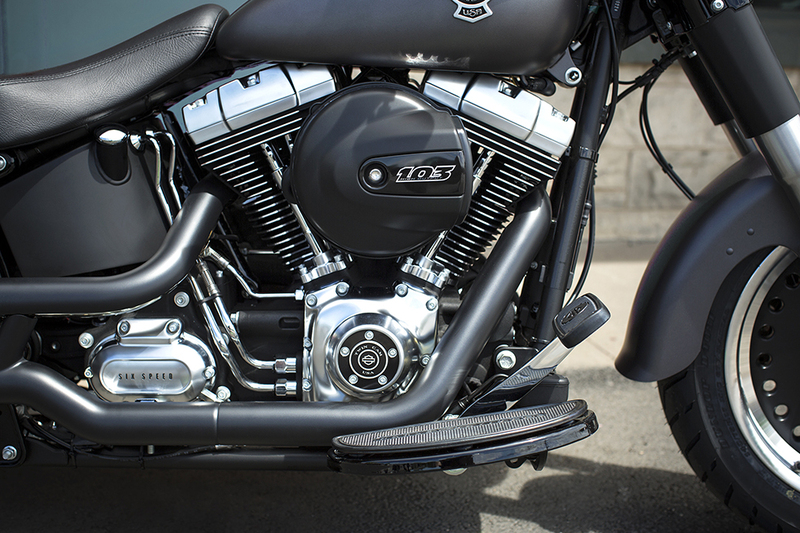 H-D® Smart Security System (Optional): If you’re looking for more security, you can opt to upgrade to the latest security system to protect your bike. 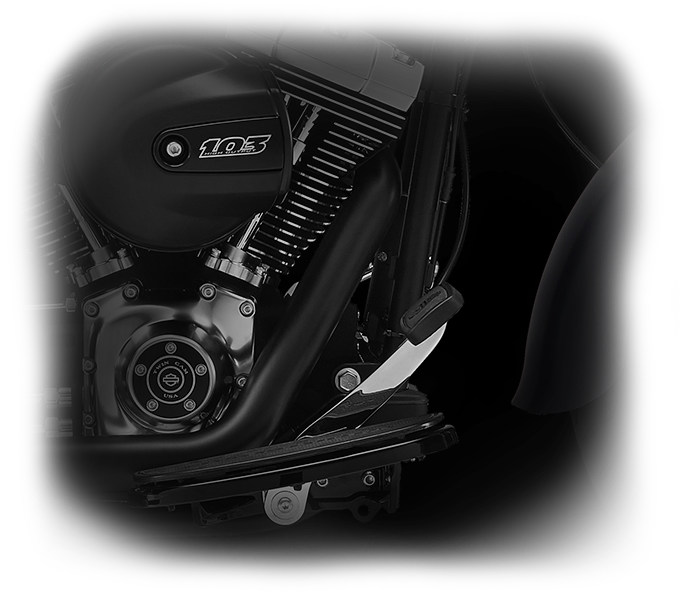 This system automatically activates when you step away from the bike and deactivates when you return. 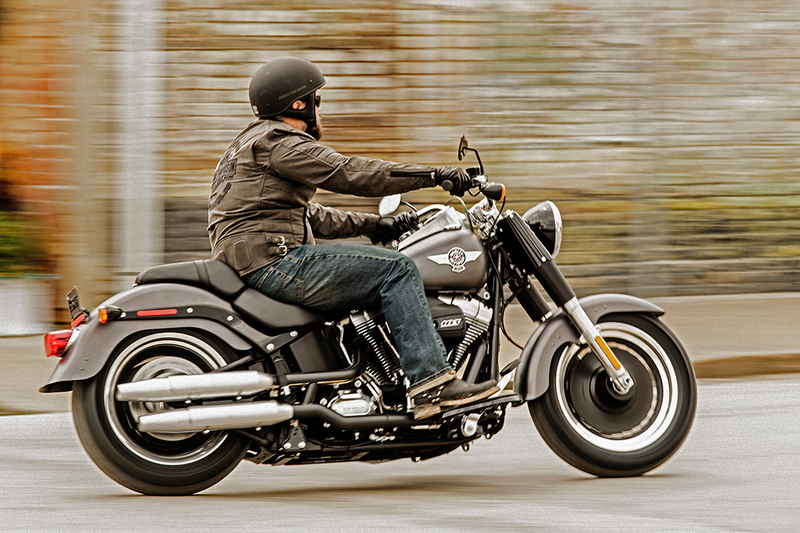 Anti-Lock Brakes: The Fat Boy® Lo comes standard with antilock brakes. 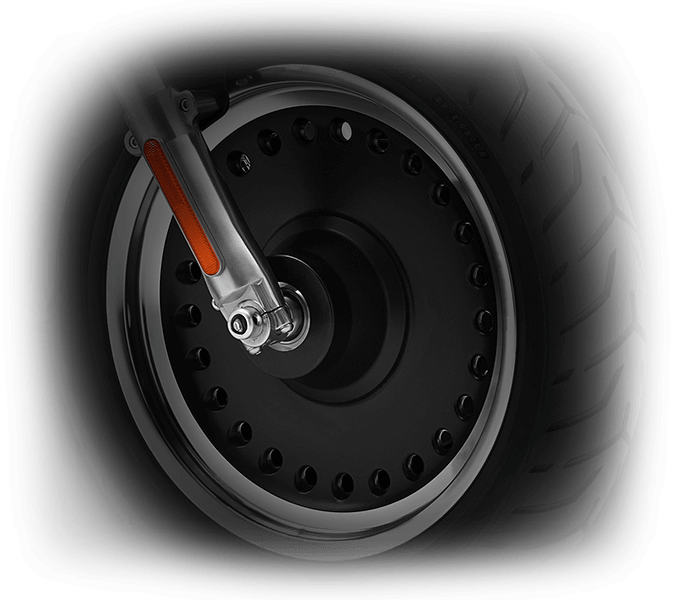 While your oversized tires help prevent lockup during hard braking, you’ve got even more peace of mind when you’ve got to rein things in quick on slippery roads. The Fat Boy® Lo delivers the kind of comfort that you need for a long haul ride. 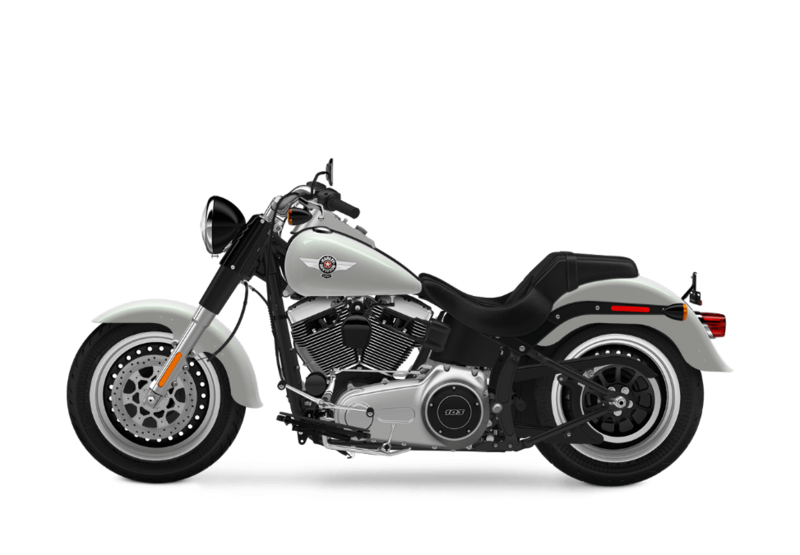 Low Profile Chrome Handlebars: These low reach, low profile bars put your hands closer to your body to provide plenty of comfort. Narrow Seat: The narrow seat makes it even easier to get your feet to the ground at a light. This feature benefits smaller riders as well as anyone who wants a whole lot of confidence. 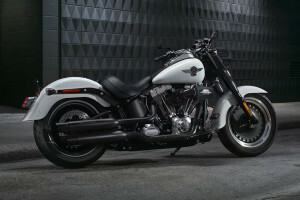 Full-Length Rider Footboards: Full-length footboards add even more comfort on longer rides, and they help this bike fit a large range of riders.